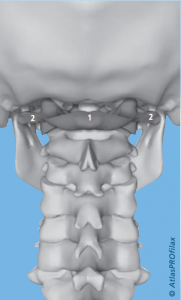 Atlascorrection is a treatment of correcting the first cervical vertebra, called the atlas. 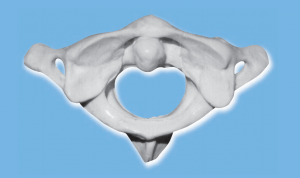 This vertebra is a little bit more broad than alle the other vertebras laying under it. In 99% of the human the atlas is not laying straight. Meaning, it has two small points which fit exactly in two little holes, but it is not laying in this holes. This has an effect on the whole spine, the hips and pelvis and on the legs, and on different organ- functions because through the hole in the middle of the atlas there are a lot of nerve-paths that do not have enough space if the atlas is laying wry/on one side. The atlas is having this wry position because of manipulations during birth, other manipulations during life or manipulations because of defensemechanism which triggered a reflective movement within the upper muscles of the neck later in life. Interesting is that it also can be that this atlas is not laying on the right place from birth on and that if it is corrected within the woman, there are children born with who it is laying on the right place. They connect it within this with something in the DNA. The massage to correct the postition of the atlas, is giving with a small machine which goes deep into the muscles. The treatment is short, a few minutes, and the one who is giving the treatment, is holding the head with the other arm which gives support in the painfull massage. After the massage one will be checked again if the turning of the head is alligned and if the legs where laying in the right possition. There can be reactions and corrections within the body for up to a year because the body has to correct itself within this new standing, which can be supported with other treatments, and ofcourse by applying self-forgiveness and self-corrections to align the mind with the physical within this process. Most of time it is a permanent correction of the atlas, as it lays on the right position it stays there. For more information and personal writings about this treatment, click here.